Accelerate is your opportunity to get more clients, command higher prices, expand your business, and crush your competition… all before the end of 2017. We’ve made sure to only bring you the best of the best for this year’s speakers. In fact, we have a rule that guests can only speak on stage if they have a rehab business generating 7 figures or more – and some of them are even generating 8 figures! We gathered the brightest minds of the best rehab businesses in one place at one time, so you’re set for a powerful experience that will fast track the success of your health business. 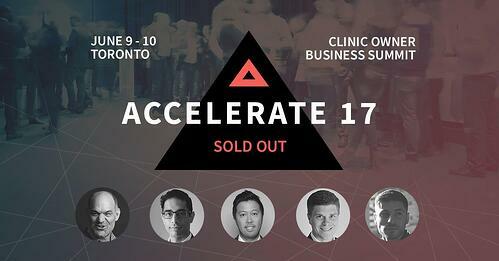 Accelerate is the first event of it’s kind in Canada. An event where industry experts share all the secrets, wins and mistakes they’ve learned from working in the trenches to building their 7-figure empires - secrets that will help set you on the easy road to accelerating your practice. Accelerate features more than 13 industry experts delivering killer strategies that will open the floodgates of new patients and an ever increasing revenue. 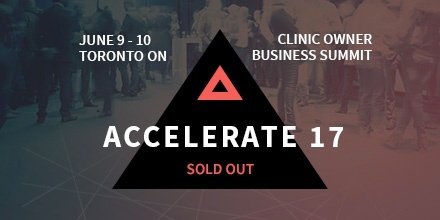 Attending Accelerate is the cheapest healthcare MBA you could ever get - and fast! Unlike most events, you won’t leave Accelerate with a bunch of theory you have no clue on how to implement. You will leave with clear, actionable goals and strategies. Our implementation workshops will give you highly engaging, collaborative sessions that aim to provide you with practical, tactical steps you can implement the day after the event. If you don't have or want a practice doing at least $1M in annual revenues or more. You want to spend all your time learning and trying to implement an ineffective marketing strategy for yourself on a small scale. You have self limiting beliefs that will only hold you back - for example, “My clinic is different” or “This only works in the big cities” - if you are NOT willing to open your mind to other ways of doing things and possibilities bigger than your current thinking, this event is not for you. You’re willing to take action and change the way you are currently operating your clinic for rapid acceleration. You want to put key systems and processes in place so you can run a more successful health business that does not always depend on YOU being there. You want to earn more, work less and enjoy your life more. 11:00am Doctor referrals: We interview busy doctors and get you the inside secrets on how to get more referrals from ANY doctor. This summit is all about getting MORE PATIENTS and MORE PROFITS and we want every clinic owner who attends ACCELERATE to grow and prosper. That’s why we’re giving EARLY BIRD REGISTRANTS a Free 60 minute One-on-One Business Strategy Call. This is a one-on-one coaching call with one of our experts where you can talk about any of your business challenges and be given specific practical tactics suited to your individual business. This call alone is valued at $500. Our generous sponsors are putting together exclusive ACCELERATOR Bucks for all our early bird participants. And we guarantee you’ll get at least $500 in value. You can use these Bucks to save money across a wide range of clinic supplies, services and offers. During the ACCELERATE implementation workshops, we’re going to make sure you have clear action steps to apply when you return home. Our estimate is that when you execute these patient engagement tactics (Day 1) in your clinic, you’ll increase your revenue by 30%. That means if you don’t attend ACCELERATE and your practice currently earns $200K, you’ll be leaving $60K revenue on the table… Even if your practice only generates $65K right now, you’ll still be leaving $20K on the table… you can’t afford to do that! We have some seriously mind blowing strategies to share — we’re talking total game changers here! From easy (and affordable) digital marketing, to using Facebook properly, through to branding and doctor referrals - you’re going to walk away from ACCELERATE 2017 with the insider knowledge to building your own 7-figure clinic success story. If each patient is worth an average $500, just getting 2 extra patients will return the money it costs you to attend the summit. When you go home and implement these killer practice-building tactics, it will be a breeze to get 2 new patients (and we know it will be more). You’ll be joining us in the place that was built for creativity and collaborations of high growth startups to accelerate - the DMZ is leading business incubator for tech startups in Canada. DMZ helps startups build great businesses by connecting them with customers, capital, experts and a community of entrepreneurs and influencers. Get set to enjoy a powerful business experience located in the heart of Toronto. DMZ has 32,900 square feet overlooking the heart of downtown Toronto at Yonge-Dundas Square. The DMZ is located at Yonge and Dundas in the same building as the Cineplex theatres. From the ground level, take the elevators in front of the Starbucks to the 6th floor (watch for the Accelerate 2017 signs). Don't take the escalators up - if you have reached the second floor where the entrance to the Winners is you've gone too far. You won't be able to get to the DMZ from the escalators, you have to take the elevator.